Detectives hoping to identify a man whose body was found in woodland have released a facial reconstruction. Skeletal remains were discovered in woodland off the A419 near Cirencester, by workmen in May last year. Gloucestershire police said the body had lain undiscovered for some time and there were no suspicious circumstances. 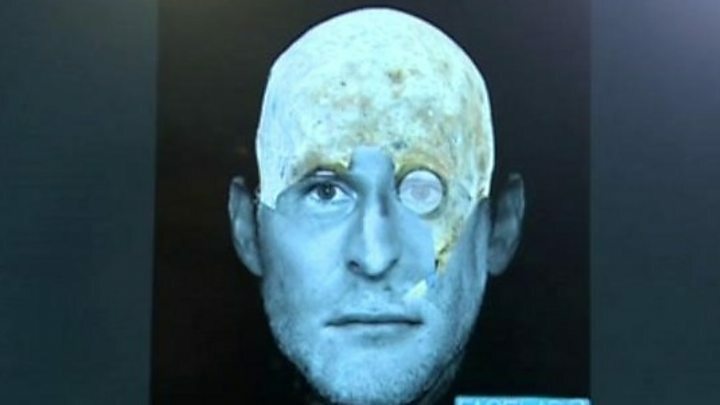 The man's identity remains a mystery almost a year on, so experts have created an image of his face in the hope someone will recognise him. Det Ch Insp Richard Ocone said the body was "pretty decomposed, and was in effect a skeleton" when it was found. He said the man was probably in his early 30s - although could have been as old as 55 - between 5ft 5in (1.67m) and 5 ft 8 in (1.77m) tall, and likely to have been a white British national. Det Ch Insp Ocone said: "We're potentially dealing with somebody who's perhaps walking distances between locations, and having no ID or money or a wallet on them is part of their lifestyle. "It's a bit of a quandary at the moment, we just need to know who he is. "This man will be somebody's son; he may well be somebody's brother or uncle." The body was clothed in a black or dark grey Peter Storm raincoat, a grey/blue short-sleeved shirt, a black gilet and blue trousers with a dark leather belt. Dark trainers with a white sole and a beige baseball cap were found nearby. DNA provided no match with the national DNA database or the missing persons database, so the facial reconstruction was created by experts at Liverpool John Moores University.